Rain, pouring rain. It had to happen at some point, especially in Vancouver, which is notorious for the quantity of its precipitation. At least the Pacific Northwest seems to have saved the wettest of the weather for our last day. The plan today is to check out the hotel and head towards Granville Island public market for breakfast and a look round before catching our late pm flight home. This seems a good plan, but didn’t account for the fun of actually getting off Highway 99 on to Granville Island. The bloody GPS again; it seems to love drawing indecipherable spaghetti roads on the screen and calling out turns on the opposite side of 4 lanes of traffic just as you’re passing them. You can tell we had fun. After a couple of passes I gave up and managed to approach the island from quieter roads on the landward side. Another frazzled start to the day courtesy of the Vancouver traffic. Once on the island we seemed to have arrived fairly early in the working day, and hence easily managed to get parked near to where the main market building was. 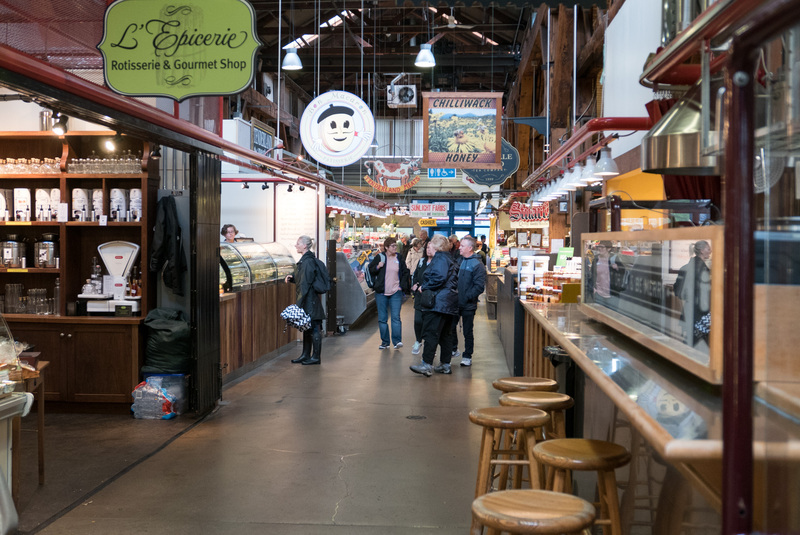 For those who don’t know anything about this place, Granville Island is a former industrial area that has been re-purposed as a public market and entertainment complex – pretty much a tourist hotspot. It was still pouring with rain so we quickly splashed through the puddles to the main market building, and once inside, threaded our way to the Blue Parrot Espresso Bar located right at the back of the market. We quickly commandeered a table next to the large windows overlooking False Creek and the water buses buzzing back and forth to the island and points beyond. I keep calling it an island, but actually it’s a peninsula, hence my ability to make my way on to the ‘island’ from the landward side. Our last breakfast in Canada was very different from the previous 14-odd. The Blue Parrot is very much a fast food-type joint, catering to largely to the stallholders and other workers in the market. Our breakfasts arrived on paper plates with disposable cutlery, so quite a ‘come down’ in some ways! The food was fine though and the view, despite the weather, was splendid. That’s all that counts, hmm? 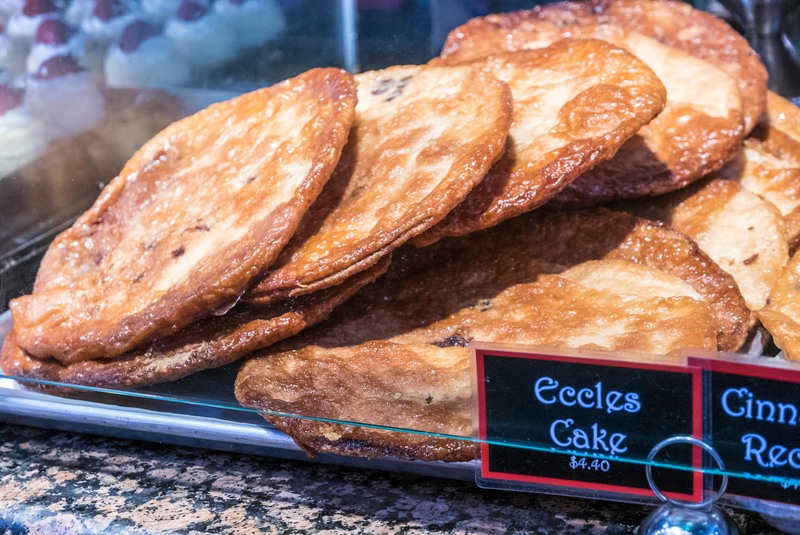 The strangest-looking Eccles Cakes I have ever seen! Breakfast disposed of, we then wandered round the market for a good while. Prices were pretty expensive, very much aimed at tourists, but we did manage to pick up a good deal on some small bottles of maple syrup. If we’d bought it in gallon containers it would have been cheaper still, but who in their right mind would try and get a gallon of syrup on an aircraft? By this time the place was much busier, and there were even guided groups of tourists wandering around, snapping pictures of everything. Having circled the market twice, and still too early to be thinking about airports, we decided to brave the rain and explore the craft shops of the ‘island’. Once again these turned out to be hugely expensive, so although there were many nice things to look at, there was nothing to buy. It never helped to recall that last the time we were in Vancouver, the exchange rate was close to $2 to the pound, which can’t be far off 50% better than we were getting this time. Finally, having exhausted the shops, and not really keen to explore the more outdoorsy areas of the island in the rain, we headed back to the car for the 12-mile drive drive out to the airport. The GPS took us straight to the rental returns, which is not surprising, because if one thing they program in to the GPS carefully is where to return the car to! After checking and signing the car off the rentals guy gave us a lift to the terminal in our own car, so instead of waiting for the shuttle bus we didn’t even have to unload the cases until we got to departures. Very cool service, even of it felt a bit odd to be a passenger in a car I had just driven for the best part of 1200 miles. The wait for the aircraft was as long and as boring as you might expect, but at least there were no problems with security or immigration this time. 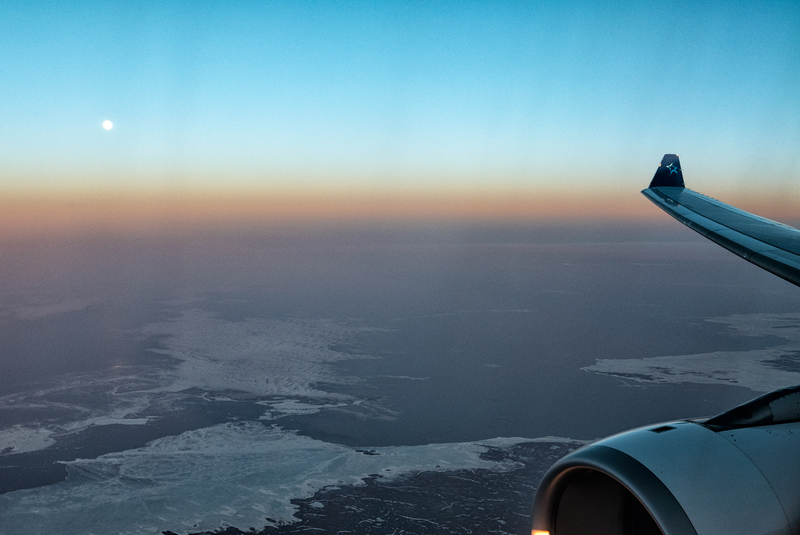 The flight too was fuss-free, although I seemed to spend hours and hours staring at endless empty vistas of tundra and lakes – the top of Canada is very big. The occasional sight of a town or some lights in among all the emptiness prompted musings on the practicalities of life in these lonely places. It must be very different. However, all things must come to an end, and eventually after passing over Greenland in the dark, the Hebrides appeared under the wings and we were soon descending into Manchester. Our trip to the Rockies was over.